5Kevents.org was formed in 2013, after several years as a Plan Ahead Events Franchise. Our very 1st event was held in 2010 for the Racine Unified School District where we orchestrated a spirit run for local schools under the name RacineKids.org. Today we orchestrate events nationwide and our staff has over 40 years combined experience in the industry. We provide training, guidance, and counsel to organizations looking to use a 5K Run / Walk as a fundraiser and to entrepreneurs who want to start their own race timing business. We coach and assist Race Directors, Timing Companies, Event Planners and Non-profits refine their existing events so they are more profitable. One of the greatest assets is our themed and trademarked events that can be reproduced for local organizations to help raise awareness and income for the organizations they support. There is more to directing a 5k race than appears on the surface. From securing routes and attracting sponsors for your event to marketing your event and protecting events in your area, you will learn it all with our online resources and consultants. Most importantly, you will learn how to make sure your race doesn’t lose money! We are consultants, not a network or franchise. We do not charge royalties or maintain control over our clients; we are supported by our clients who find value in being a part of our system. Race directing involves managing a number of different facets of the event as well as providing the best possible experience for the athletes. 5kevents.org on-line resources will help clients navigate issues such as course standards and set up; timing services and results; access to online registration tools, free web sites and buying power for supplies such as T-shirts, medals and ancillary items; We teach you how to work with your city and county for permitting and insurance requirements–and much, much more. So if you want to take that first step by learning more more about Team 5K Events™, please contact us! To share our love of competitive and cooperative running by bringing people together from all walks of life. We work to provide a family oriented, happy, healthy, enthusiastic atmosphere to run and socialize while supporting our community and charitable organizations. We use our passion for running to build friendships, provide encouragement, and improve ourselves with no regard to age, cultural differences, gender, pace or experience. Our goal is to learn and grow through our shared experience, and to leave no runner behind. 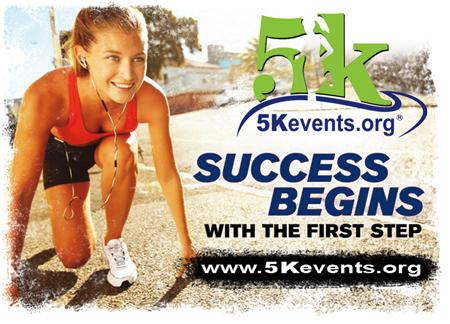 5Kevents.org provides race directors the most complete and dedicated run/walk event platform in the industry! As the very first of its kind, we are committed to creating and building an elite team of race directors. Our commitment to the growth of our clients and our focus on helping local charities will be unsurpassed. 5Kevents.org® not only provides you an opportunity to fine-tune your existing events, it offers you exclusive & protected territories to duplicate our unique and trademarked events along with online tools, race resources, ongoing guidance and counsel.